I love science. Science is rigorous reasoning applied to actual physical stuff. It lets us build the computer I’m typing on, and the internet through which i share it with you. It grows my food, gets my food to the grocery store, and also cooks it. The progress of science is literally responsible for the first world lifestyle which I am privileged enough to live. I’m not that well off, but I still live a damn sight better than anyone in the eleventh century did, kings included. Science, while not my favourite branch of philosophy, is certainly the one which has done the most for me. That’s right, science is philosophy. It’s philosophy that works. Even Isaac Newton described himself as a natural philosopher, not a scientist. I try to repay science by doing good things with the advantages it gives me, and by learning as much about it as I can. I may not be able to build a laptop from scratch, but I understand the principles that make the transistors inside it, what makes the electricity flow, and why some metals are better conductors than others. I want to spread this love of science, because the better we get at it, the better we’re going to live. But sometimes I talk with people who don’t love science, or who don’t trust it. They prefer intuition, or tradition, or just don’t like the things that it says. The details vary, from the perspective that we, as mere humans, cold never really understand anything about the universe, to the notion that there is a conspiracy of scientists suppressing miracle cures and mystical ideas. Science isn’t stable, and it’s coldly rational rather than taking into account our beliefs, they say. I could complain about that, but instead, I want to do something positive and show that those are actually the top three reasons why science, which is the application of the scientific method to data sets gathered from empirical observation, is awesome! Scientific facts are independently corroborated and ascertained, and their theories seek to be as general as possible. This means that physics in America work exactly like physics in India, and as does chemistry, biology, and astronomy. The particulars may differ, thanks to differing environments, but if the principle is sound, it will apply in both cases. This is awesome because it means that we are uncovering parts of universal laws and constants, whether that’s radioactive decay rates or that Force equals Mass x Acceleration. Things things, according to all of our evidence, apply in all relevant places and in all times, allowing us to map the history of the universe with our observations. Some of the laws get fuzzy when objects get really big, really small, or really fast, but hold for practical purposes. This constancy seen independent of human belief allows us to make the predictions necessary for the scientific method to work, and they do seem to be working pretty well, when it comes to medium-sized dry goods like us. Science isn’t just about proving a new theory or disproving an old one, it’s about doing it first. The paleontologist who finds a fossil bunny in pre-Cambrian strata would go down in history with names like Einstein, Galileo, and Newton as the person who defeated Darwin and overturned the notion of gradual evolution over millions of years. The research firm that discovers a cure for cancer would not only make millions, but be regarded as brilliant saviours. This is awesome because it means that science never has an incentive to stagnate. Even if a theory seems like a sound one, it has to be tested further or someone might overturn it. An example of this is Euclidean geometry. This system of geometry was created by Euclid in ancient Greece, and it’s the geometry we learned in school, where the sum of the interior angles of a triangle are 180 degrees. That model stood for over two thousand years, until several mathematicians in the 19th century invented non-Euclidean geometry which, while an interesting curiosity, was given a big boost by Einstein when he showed that it actually gave a better picture of our spacetime than its Euclidean predecessor. Competition means pushing forward. 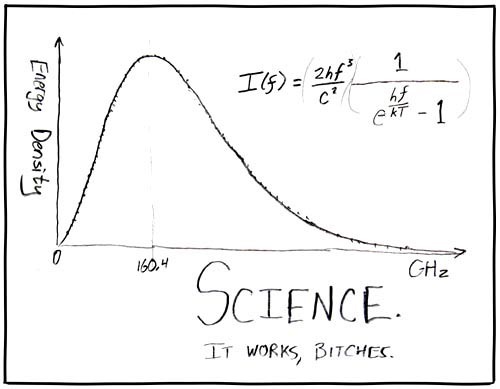 This is the best thing about science. It’s never stable. It’s always looking for new information to incorporate, and willing to incorporate new facts, so long as they’re clearly demonstrable. Scientists throughout the ages have practically raised being wrong to an art form. When their theories are overturned, they take what they’ve learned, develop the new facts, and move forward. Our information about the universe is always changing, so any decent system of understanding the universe needs to change too. Nothing is sacred, everything is open to revision if there are good reasons to do so. I mentioned modern bunnies in the pre-Cambrian strata, but it applies to anything. If tomorrow morning, people began flying around on broomsticks, growing more arms, and commanding the winds, our scientific theories would simply adapt. Anything can be studied methodically, rationally, and patiently, and doing so often leaves us richer for it. So these worries we have about science? They’re why it’s great. They’re literally what makes it great. It challenges our common sense (which tells us that the sun goes around the earth ) by being based in merciless observations and rigor. It rushes forward and encourages us to build on the work of others, becoming part of the tradition which has without a doubt done more good in the world than any other. And it keeps us humble, constantly reminding us that we don’t know everything, and that anyone who says they do is fooling themselves.